Christopher Brookmyre’s short story place b., contained in his anthology, Jaggy Splinters, includes a rather amusing story about how a journalist goes undercover to sting the fictitious NHS Hospital, the Edinburgh and Lothian Homeopathic Hospital. What would happen if there was a break-in by sceptical activists at a homeopathic pill manufacturers where the pills were swapped for blank sugar pills? How would the homeopaths at the hospital react when newspaper stories revealed they had been using blank pills for months? Of course, the initial horror of the homeopaths is quickly dissipated after patients, having read the reports, start coming forward to say that their pills had not been working as expected. So, spoiler alert. Skip the next two paragraphs if you want to read the story yourself. The doctors see the opportunity to turn the disaster into a PR coup and so write a paper and hold a press conference to say the unexpected ‘blinded experiment’ has confirmed the effects of homeopathy. As soon as the hospital had been able to source an emergency source of remedies, the patients started reporting the beneficial effects again. But unbeknown to them, the journalist at the heart of the story had faked both the footage of the break-in at the pill factory and had also set up a fake homeopathy clinic, place b. The hospital had been tricked into using place b as the source of emergency remedies believing the story that it had received the hospital’s original supplies in error. So, when the hospital had been claiming ineffective pills, it had indeed been receiving the genuine product, and when it has been claining renewed success, it has in fact been using blank sugar pills as supplied by the journalist. Brookmyre is playing with the idea that the effects of homeopathic remedies are all expectation and confirmation bias. But the story also highlights the impossibility of providing effective quality control for homeopathic pills. This fictitious story highlights a very real problem in homeopathy? How do homeopaths know that the pills they give to patients really are the pills they wanted to give? Since all homeopathic pills have been diluted to such an extent that all pills are physically and chemically identical, there is no test you can do that would reveal which homeopathic remedy you have should the labels ever be removed. Uniquely in the medical world, the homeopathy industry can have no complete quality control mechanisms in place. There is no way of telling if the break-in actually occurred, whether computer records were correct and not tampered with, whether shipments made really were what was ordered. In itself, this should be enough of a reason never to use homeopathy. In the real world, do such problems exist? What sort of quality control is there within homeopathy suppliers? 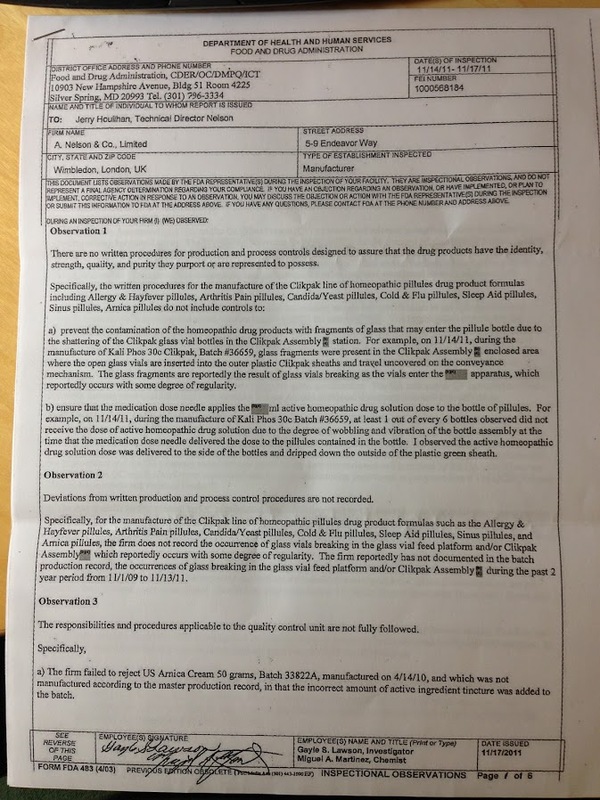 We saw a few months ago how the UK’s leading homeopathy supplier Nelson’s had received a damning letter from the US FDA. Imports to the US had been suspended while quality control issues were being sorted out. We can now see the full extend of the issues. Tim Farley of WhatsTheHarm.net posted an inspection report following an FDA visit to London-based Nelsons. Laboratory controls do not include the establishment of scientifically sound and appropriate test procedures designed to assure that components and drug products conform to appropriate standards of identity, strength, quality and purity. Remember, homeopathy pills are chemically and physically identical, no matter what is on the label. There can be no scientifically sound technique to ensure the pills are what they say they are. Homeopathy is a form of sympathetic magic. You cannot test for magic and that the rituals have been performed correctly. Bizarrely, Nelsons look like they try to test with infrared spectroscopy. But the FDA quite rightly point out that the test is carried out incompetently. I can confirm that the audit undertaken was on a targeted area of their business. I can assure you that this does not affect any of their products supplied to the UK market. Quite clearly, given the findings of the FDA, Boots have either been misled or were misleading me. Holland and Barrett wrote to me to say that they had passed on the concerns to the UK regulators, the MHRA, who had not expressed any concerns and so they were not taking action. How can we explain such a complete failure of manufacturing standards and quality control? The cynic might argue that all involved in the supply chain, the manufacturers, the retailers and the UK regulators all know that homeopathy is a sham that only delivers sugar pills to the gullible public. Why then waste time and money on quality systems that can never work? We know that Boots for example are quite aware of the lack of evidence for the efficacy of homeopathy after they testified to an MPs’ select committee to this effect. But of course this cynic’s view does not explain why they are not concerned about the lax production standards that could lead to routine contamination. 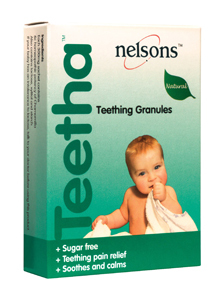 I am happy to accept that Nelsons believe their products work. They are homeopaths. And an axiom of homeopathy is that it is perfectly safe. Why then waste time on QA when you have total self-belief and a delusional mindset that thinks you can do no harm? This still does not explain the shoddiness of the production environment. Once again, we must look to the regulator, the MHRA. Why did it take the Americans to uncover this string of failures? Why have the MHRA not taken action in the UK to prevent this uncontrolled business shipping supposed medicinal products to consumers when there is absolutely no quality control in place? Just as the MHRA only takes the most minimal action over homeopaths making life threatening claims with their products, we do not know why they are so appallingly inactive and friendly to the peddlers of homeopathic delusion. We’re sorry, but you do not have access to this document. That’s all we know. However you can enlarge the picture on both an iPad and a PC, enough to make it legible. The quality isn’t great, but it’s generally readable. They could hire a wand waving wizard from Hogwash or a disciple of Lord Fooledthemmore to perform QC spells on nonrandom samples from the production line. That makes as much sense as the product does. It’s from Nelsons’ competitor, Helios, but I’m sure they won’t mind. I like the admonition to take care not to have 2 or more potentized bottles open near one another for fear of cross contamination. They play it to the hilt as if there were differences between bottles. The one towel by the wash station is a little disturbing. Also leaving bottles open during flu season may get them potentized by a foreign agent if the dispensed bottle is rapped enough on the way home. How can a purchaser be sure their chosen remedy has not been contaminated by homeopathically prepared horse meat? But unbeknown to them, the journalist at the heart of the story had faked both the footage of the break-in at the pill factory and had also set up a fake homeopathy clinic, place b. The hospital had been tricked into using place b as the source of emergency remedies believing the story that it had received the hospital’s original supplies in error. So, when the hospital had been claiming ineffective pills, it had indeed been receiving the genuine product, and when it has been claiming renewed success, it has in fact been using blank sugar pills as supplied by the journalist. Archie Cochrane once played a similar trick on some cardiologists in real life. One could hope that the MHRA are stung into action by this damning article. But hope is probably futile. The reason for their spineless inactivity may just be overload. The massive documentation demanded of real medicines can be overwhelming, running into tens of thousands of pages. Given the secrecy within which the MHRA works it is difficult to ascertain just how they allocate their time. It’s Christopher Brookmyre, not Brookmyer. Your instance that the MHRA should some how single out Nelsons needs to be considered in context. Let me enlighten you. In the most recent MHRA annual review of inspection deficiency data covering 303 inspections there were 26 critical findings and 644 major findings. The MHRA would therefore regard this deficiency as Major as the deficiency is not a threat to human health. If the MHRA had found this deficiency then it would have been 1 of 640+ deficiencies found in several 100 pharmaceutical companies. If however we take this deficiency as a critical in the same way it would be for a pharmaceutical company cocking up drug manufacture then production would be stopped until an exaustive process took place. None of the 26 companies with critical deficiencies would be shut down though unless there was no action or continued similar problems found with the inspection that follows critical findings. Why should Nelsons then be singled out for special treatment? By the way I was waiting to see what sting you managed to come up with. You managed to milk what you got pretty well but I still dont see the end of homeopathy. I am becoming impatient Alan. As so often, Gc, your post is barely grammatical piffle to which it is very difficult to respond. I read Andy’s blog and do not see him requesting any kind of singling for special treatment of Nelson’s by the MHRA. Why have the MHRA not taken action in the UK to prevent this uncontrolled business shipping supposed medicinal products to consumers when there is absolutely no quality control in place? You have turned that into a strawman. Obviously we would like to see Nelson’s shut down, but the MHRA has many other enforcement options open to it. The issue is that the MHRA appears to have done nothing at all. The problem for Nelson’s and their industry peers is that if any action is started and followed through with professional diligence then they are seriously screwed because you know as well as we do that it is literally impossible for them to satisfy any proper QA programme. They can’t tell one bottle of tablets from another except by reference to a paper trail. Can you suggest how they would prove that the bottle labelled Belladonna 30C contains only tablets that have been put through that process rather than the one that results in a bottle of sugar pills labelled Aconitum 200C? You do know, I assume, that it is been said by a homeo pharmacy that the only way to distinguish the bottles is by the label. You do know, I assume, that it is been said by a homeo pharmacy that the only way to distinguish the bottles is by the label. Actually, I think it was “a senior lecturer in homeopathy at the University of Central Lancashire”, representing the Society of Homeopaths (sse Q502 on the previous page of the committee proceedings). Q538 Lord Broers: I have a simple, technical question about homeopathy and drugs. Is it possible to distinguish between homeopathic drugs after they have been diluted? Is there any means of distinguishing one from the other? For some reason the link didn’t work. Here it is again: link. I like observation 1 b) – where it notes they actively observed 1 in 6 of the homeopathic preparations not receiving any ‘active homeopathic drug solution’ as it dripped down the outside of the bottle due to the manufacturing process. Genius. That’s one way to ensure it’s really been diluted to the point nothing is in there…. Of course, you are leaving out the most obvious way of producing effective, quality controlled homeopathic remedies, which is childishly simple. Take a supply of chalk pills and a bottling machine. Set the production line up to put pills into bottles, and seal them. Then, as the stock control system demands, label these bottle of inert pills as needed and as they leave the labelling machine, wave a bottle of the potentising agent at them in a significant manner (whilst trying not to look like a complete pillock in the process). And no one would ever know the difference. Easier – the name of the remedy can impart the voodoo onto the pills. This means the pills will always be right. Change the label get different pills. If you think I am making this up, paper remedies are a real thing. Dan H- Chalk pills? That made me laugh. Pills are made from sucrose by the way. It is quite clear BSM that you want Nelsons shut down. That is your opinion but the MHRA cannot show bias against Nelsons. You deflected my point about why Nelsons should have some kind of special treatment for this. Do you want a running commentary on the MHRA twitter feed? Statements to the media? An open inspection? Sorry but Nelsons get treated the same as everybody else. These things get delt with by the MHRA’s usual procedures. The trouble is that none of you have much of a clue about this. Looks like more frustration for you then. Keep it all coming. You deflected my point about why Nelsons should have some kind of special treatment for this. No. I answered your point. You seem not to have understood the answer. I do not want special treatment for Nelson’s. I want the MHRA to do their normal job and exercise their normal powers. As with MHRA, so also with Trading Standards, they simply fail to do their job for a variety of reasons. Despite those problems, I have caused enforcement action to be taken against a number of woo purveyors so I am sufficiently aware of the process, thanks. Sorry BSM but you are clearly not aware of the process. The MHRA has exercised their normal powers in dealing with Nelsons. The MHRA would have been in contact with Nelsons and the issue delt with. ie remedial action would have to have taken place before production could continue. Their normal job does not involve shutting companies down unless an issue persists and/or there is no acceptance or cooperation. So please tell me what exactly the MHRA should have done then with Nelsons? Please tell me BSM what the MHRA should have done then with Nelsons and this issue? Remember the MHRA have to justify every action that they take according to regulations. Holy speculation, Batman. Our feline friend is just guessing. You don’t know what the MHRA has done and nor do I. All we know us that Nelson’s are still making sugar pills. The MHRA could have effectively shut down homeopathic manufacture in this country but instead decided to plump up the pillows and bring them breakfast in bed. Pills are made from sucrose by the way. Or lactose. Not that it matters, but we may as well be accurate in our discussion of this insanity. I really want to hear your views on grafting, paper remedies and the various electrical gizmos that claim to make homeopathic remedies. In common with most homeowhatsits I dont have anything to do with the above so I leave it all to you to sort it all out for me. 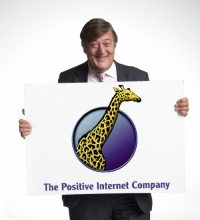 Personally I am very happy to let them all get on with it. As usual, when you have your back to the wall you turn and run. It doesn’t work very well. Why should we sort it out for you? Their manure is in your stable and the smell sticks to you. Our job is to point and laugh. The problem for you Grumpy is that the users of paper remedies base their practice on the same evidence as you. Do you really not see the problem? Another ten minutes of my life I will never get back. Straight down the crapper. I will try a controlled experiment this evening to test the concept. I will write “Get Hammered” on a piece of paper. Put it under a small glass of water (very small indeed as I want to increase the potency and do not want diluted nothing). I will then drink two bottles of Pinot Noir and see what the results are. I shall report trial outcomes tomorrow (probably not too early though). That nonsense reminds me of Charles Stross’ Laundry novels where the anti-spooky spooks have to accurately account for every paper clip they use in case they get quantum entangled with the documents they bind and their supernatural enemies can read all the information from the paper clips. Stross is merely taking the piss, whereas these quacks are, errr, umm, like, whatever. BSM. I am not asking you to sort anything out. Only you and a few of your friends see manure sticking to me over this. I am not sure that you really are laughing over this. I fear that your lack of success is just getting you wound up. Take it easy BSM. Dont forget we have to put up with you! The use of the Law of Similars must require some small amount of magical “quivering”. Is this available in unlimited quantities, or is it being used up? Paper remedies must require a at least an equivalent amount of “quivering”. The MHRA cannot possibly find deficiencies in production lines if it does not have a wizard on staff; otherwise, how can the potentizing be determined to be sufficient to be effective. Homeopathy offers endless possibilities for farcical musings. Imagination seems to be the only limit. It occurs to me that homeopathy is like a zombie, magical and no matter how many times you shoot words at it, you cannot stop it. Moves very slowly, has mad staring eyes, drools and moans and random bits fall off. If the homeopathic nostrum loses its magic aura, I would deem it impotent. That is the scariest word in the English language to most men. Perhaps a campaign that suggests these products may be impotent and by association may then cause it. Yes. And nothing but sucrose. No active ingredients, no medication, no trace of anything but sugar. That is your problem not mine. How can a “fact” be my problem? It is your problem as it obviously concerns you. Beside the paper remedy “theory,” homeoquacks believe if you put one “active” sugar ball in a vial with plain, untreated sugar balls, that one ball will transfer its magic power to all the others in the vial. So why do they even need to keep making the stuff? Just make more with one ball left over from the previous batch. It’s like a baker or beer brewer who keeps regenerating the same strain of yeast based on a small original culture. Some breweries are using yeast cultures than go back hundreds of years. I even saw a little hand-held gun that “manufacturers” homeoquackic pills by merely speaking the name of the desired remedy into the machine. C’mon, even branwashed homeoquacks don’t believe all this stuff, do they? Why would they not believe it? I’ve always wondered if there is anything that it TOO outrageous for even woomeisters to believe. For instance, would a homeoquack look at reiki and say to himself, “OK, that’s just too ridiculous for even me to believe. It’s just hand-waving!”? Or would a reiki “master” look at healing crystals and say to himself “OK, that’s just too far-fetched”? I know part of it is cognitive dissonance, and part of it is economic. Reiki might be competition to homeoquacks (why even take a sugar pill if someone can wave their hands over you and cure you?) but since homeoquacks like to invoke “science” I wonder what woo falls outside even their strained limits of credibility. John of God, maybe? Generally though, purveyors of all kinds of competing woo form some sort of unholy alliance and band together to fight the evil Big Pharma. But a machine that makes pills just by speaking in the name of the remedy? What science can they possibly invoke to justify/rationalize that? I ask these questions of homs very often. They run away. Notice that Grumpycat has said nothing on these points I wonder whether he/she/it ever will. I came on here BSM to educate you all about the MHRA inspection process. The speaking remedy maker is your problem not mine. If you see it advertised then have a word with Alan. First time I had a Reiki I thought I was due for a massage. It was about 5 minutes into it when I opened by eyes as I wondered when it would start. Then I saw some hands waving over my head. It is all something about symbols I believe. Anyway it sounds fine to me. So lets get some on the NHS. I’m applying to my GP for a regular prescription made from a recipe of malted barley, a few flowers from natural plants, and a living microrganism. Very holistic. I just know it’ll make me feel better. Thank you all for helping to pay for my indulgence through your taxes. Stop using my name in conjunction with Dog. I am a devout atheist and demand that my non-religious beliefs be treated with the utmost respect. I found out yesterday that it is the energy contained in the H~Y sugar pill that does the job. Now what form of energy this might be was not disclosed and remains a mystery to me. It was not any of the recognised forms of energy – it would seem to me that sugar pills can release chemical energy when digested; thermal energy when incinerated with a flamethrower and kinetic energy if you roll the pills down an inclined plane. I suppose that mathematically you could calculate their gravitational effect, and good luck with that. It would appear to be some Qi like vitalistic energy which is somehow stored in the pill. How it gets there is a bit of a mystery. How it is released is another mystery. How it works is an enigma wrapped inside a conundrum. Evil scientists are apparently not revealing this new form of energy and may not even be aware of it as their tools and methods cannot identify it – it is too subtle. (which rather begs the question “how the feck do you know about it then”). The Speak-Your-Quackery machine probably works on the basis of quantum harmonic sympathetic vibration. After all, speech is noise is vibration. These vibrations probably manifest themselves in the pills. Yeah, that’ll be it. Possibly. I rest my case on cognitive impairment. Sorry about the John of god reference. (Have you ever checked that guy out, by the way?) We usually call him John of Fraud on other blogs. I see a whole new category of homeopath: the Pill Whisperer. Just whisper what you want the pill to do and it does it. Of course none of us can understand the mechanism of action of homeopathy because it’s so advanced, it’s quantum, it’s a new paradigm that nothing science has developed so far can explain or prove it. A new paradigm that was dreamt up in the late 1700s. Before medicine even existed. R-i-i-i-g-h-t. I take it grumpycat is a homeoquack? I’ve just finished reading the FDA report (Such a pity their founding act bars them from actually testing if the stuff works. ), it makes for interesting and scary reading, especially the comment that they don’t even test for microbe contamination of the product, damp sugar is the perfect medium for all kinds of nasties. I’m surprised there hasn’t been more of a focus on the risk of broken glass entering the pills (a side-effect of all that clever succussion?). Perhaps it is indeed the case that Boots, Holland & Barrett, MHRA, etc. are entirely aware of the lack of evidence for homeopathy (they certainly should be) and that there is a form of gentleman’s agreement not to rock the boat as long as there is consumer demand for sugar pills. But sugar pills with added glass are a direct health risk. I know nothing of the MHRA inspection deficiency seriousness ratings, but I can’t imagine that a “proper-pharma” manufacturer with the same issue on their production line would continue to be approved by the regulator. So it seems very odd that MHRA would decline to investigate an issue where their US counterpart has specifically identified a risk of glass contamination in homeopathic pills. Incidentally, it’s no surprise that a chemist like Boots would continue to cynically sell woo: have you been in a chemist’s shop recently? Other than 90% of the stuff behind the counter, they are veritable temples of new age nonsense. Presumably it’s “just economics” rather than genuine cluelessness about what they’re selling. You certainly do know nothing about this. Another one who has not got even the slightest clue of the processes involved. Still waiting for the end of homeopathy. Another way of explaining ‘homeopathy’ is ‘fraud in a bottle’. One of the greatest cons of modern times, is homeopathy, and they do it so blatantly and cleverly by announcing that there’s actually nothing but water or sugar in what you just paid $150 for (at least, those are the outrageous prices in Australia). But first, they’ll want to take a ‘full assessment’ of your health before they flog you their useless wares – and their ‘full assessment’ costs – if you please – no less than between $80-$120 (again, in Australia, the land of highway robbery). Of course they need to make their money up front, because they know you’ll still be as sick as you were before you came to them once you sample their bottled water/sugar pills. How better to fool the public and empty their wallets than by telling the truth followed by a lie – eg “Oh there’s nothing in it, but it works!”. Snake oil salesmen. Can we get them off the streets please?